It’s a bird! it’s a plane! it’s a sandwich?? Yo, this looks a wee bit strange. 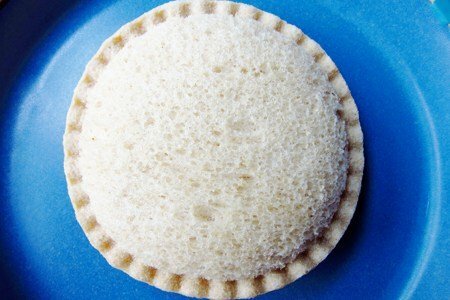 This is called an “Uncrustable” and it was created by Smucker’s. You can find it in your freezer aisle and this one happens to be peanut butter & grape on whole wheat bread. Kristine, a reader, asked me for my thoughts on this product. I went out and bought a box for $2.50 which includes 4 sandwiches. Now, some of you are just not going to give this product a chance because you cannot envision parents SO busy that they can’t make a peanut butter and jelly sandwich. My mother, who held down a job and raised two kids, used to pre-make peanut butter and jelly sandwiches and put them in the freezer. The result was the most disgustingly soggy sandwich, which I can’t remember ever liking. Yes, people, there are parents who are just trying to keep it together. But, these actually taste pretty good. My son is now demanding that I buy more. Argh (thanks, Kristine). Before I share any of my thoughts, if you can make a whole wheat sandwich with peanut butter, and jam and freeze it successfully, please comment below. Obviously, YOU can find a bread with less additives, peanut butter without added oil, and better tasting jam (and you can cut off the crust). I don’t get why Smucker’s doesn’t use less additives in the bread because the sandwich is FROZEN. They don’t have to worry about shelf-life! Oh well. Okay, now I am going to get flamed for saying that I would use these in a pinch. When you compare this sandwich to, for example, a PopTart - you can see that this has much less sugar per serving. It is 100% whole wheat as well and so I don’t think it is the worst product on the market. One PopTart has 14 grams of sugar per serving and this sandwich has only 6 grams. Another relevant comparison is to my least favorite lunch replacement - the Lunchable. There is 37 grams of sugar in the PB & J Lunchable. Don’t buy a Lunchable - if you need a quick sandwich, buy the Uncrustable. The sandwich doesn’t taste super sweet - it just tastes like a peanut butter and jelly sandwich. What I don’t like is all the packaging (plastic, cardboard) and the fact that we are so busy as a nation that we don’t have time to make our kid’s sandwiches. Until we figure out how to STOP the insane schedules that make it impossible to feed ourselves decent food, there will be Lunchables, Uncrustables, and Poptarts. Are High Fiber Pop-Tarts a Healthy Choice? Regarding the round shape: Lisa here in the south it is not unusual to use a sandwich making device that cuts and toasts two pieces of bread in one clamp like motion. My mom had a hand held version and I'm pretty sure that's where the notion came from. If I am not mistaken oxo makes a new version as does Nordic ware. Thanks Lisa! I travel a lot for work and use these for a quick/cheap lunch when I've got a fridge/freezer in my room. No kids, but would probably feed one to my niece and nephew ha. Thanks for answering my question! Trans fat in the bread=dealbreaker. 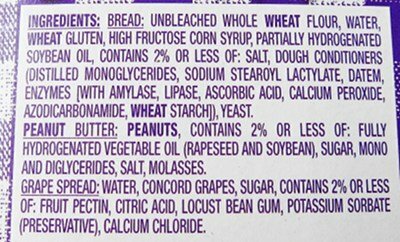 Not liking the preservatives or the oil in the pb either, but partially hydrogenated anything is a no. Lisa - I never made & froze PB&J, but these little sandwiches can work for adults in a pinch. You grab one on the way out the door and it's ready when you need a snack. Eating 3 every day isn't a good idea but 1 now and again is fine. It has trans fats and HFCS. Both are deal breakers for me! A PB&J sandwich will last in the fridge for a day or two, why not make them the night before? Not the healthiest thing on the market, but I find it better than the salt-laden pre-made sandwich kits that are out there. The peanut butter gives you needed protein, and the portion control might help those who are watching their weight and don't want to go overboard when adding peanut butter to a sandwich. You're right, though, in thinking that making one yourself is just so easy. I have one of those sandwich cutters, so I simply make my own. I can see how these sandwiches are less messy for parents whose kids often eat on the run (in the car, for example). Oh the convinces we have today! Don't get me started! I believe if we did not have items like lunch ables and uncrustables we would find the time to make a lunch! We are all busy and it is where your priorities stand as to what you will feed your family! I am one that will not buy ANY of the above items for my kids, so it takes a few extra minutes to make a sandwich and cut some veggies, turn off the TV or log off the computer for a few extra minutes to feed your family properly! Like I said DON'T get me started! Perhaps if I still had children I home I would be less haughty, but I simply never knowingly eat hydrogenated fat or high fructose corn syrup. They serve as markers for low quality food. IMO, I would seriously reassess my priorities if I even considered a faster food than PB&J! It takes one minute to make! This Smuckers item is wrong on so many accounts. They serve these in our school cafeterias. I think it's a mistake to overlook ALL THOSE additives just because it has "lower sugar" than a Pop-tart. There is RAPESEED OIL in the peanut butter - that is a pesticide!! And that's just the beginning of a long, nasty list. I make frozen PB&J sandwiches all the time! I also put PB on both sides to sandwich the jelly. I use Trader Joe's whole wheat bread, and Trader Joe's PB. To make it in the identical Uncrustable UFO shape, I use a cutter/crimper I bought from Pampered Chef I got for around $12. Love it! The left over crust seems like such a waste when I make a bunch at a time, so I use that to make a healthy french toast casserole! In the bread aisle of any store, you can get a plastic "sandwich cutter/crimper" that does the crustless part. (crusts are then used for homemade bread pudding.) I just buy a good whole grain bread along with low fat fillings (not necessarily PBJ) and, voila! Freezing them is something I haven't tried yet. I bought these for my kid to eat during summer break, he ate one and I had a Econo box of sandwiches no one would eat.Pampered chef makes the hand held gadget that works like a charm on your homemade sandwiches. Kids always like something different shaped, encourages even the pickiest eaters! Lisa, you open my eyes to products I had no ideas existed -- thanks! I don't buy into the "no time to make a sandwich". It takes so little time that the busiest of parents can somehow fit it in. Convenience is attractive, but I just can't believe people cannot find a few minutes if they actually wanted to. As to giving in to "crustless": the crust is not only healthy, because it contains a bunch of antioxidants that don't exist in the crustless bread, it also slows down eating, reduces the glycemic index of the bread, and fills you up. Encourage kids to love the crust! Don't remove it. My son begged me for these because he friend always had them in his lunch. I was set to buy them until I read the ingredients: high fructose corn syrup and partially hydrogenated soybean oil. That is an absolute deal breaker! And, there's all of the other additives to boot. This takes a simple (and should be wholesome) sandwich and turns it into processed junk food.